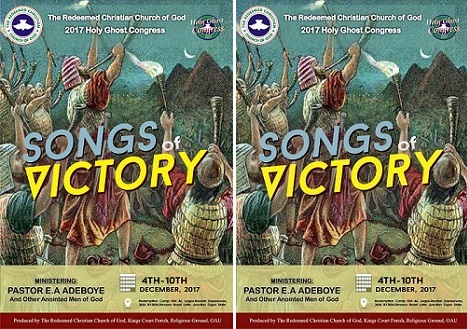 The Holy Ghost Congress of The Redeemed Christian Church of God (RCCG) will today kick off at the church’s Redemption Camp, Km 46, Lagos-Ibadan Expressway, with the theme “Songs of Victory”. The congress will run from 4th-10th of December. There will be healings, miracles, deliverance and lots more. You can also connect with them on DOVE Tv if you won't be able to find your way to RCCG Camp ground. God bless us all.